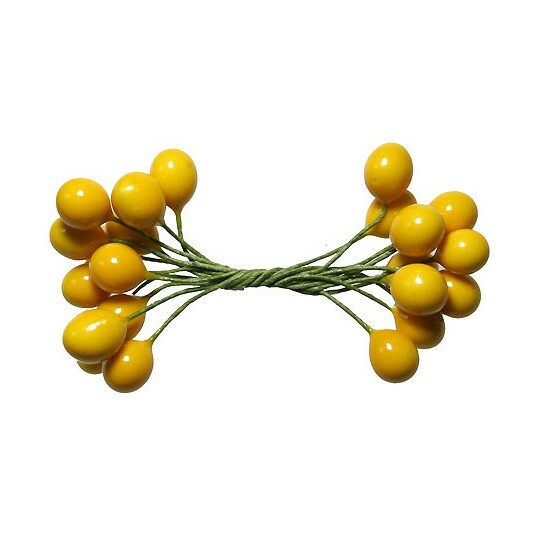 Spun cotton, lacquer, and composite fruit, vegetables and nuts make wonderful additions to a plethora of projects and our vintage carrots are perfect embellishments for Easter baskets. Meticuliously created by hand, we offer a range of newly-made and vintage styles from Europe and Japan. 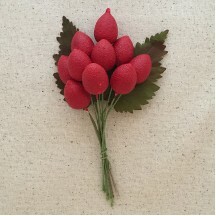 10 Vintage Red Textured Strawberries with Leaves~ 7/8"
Bundle of 10 old store stock vintage textured red strawberries with two drab green fabric leaves. Each berry measures 7/8" tall x 5/8" wide and each leaf is 2-5/8" long. Bundle is 5" long overall. Made in Germany. 9 Vintage Red Lacquered Cherries with Leaves~ 5/8"
Bundle of 9 old store stock vintage lacquered red cherries with two green velvet leaves. 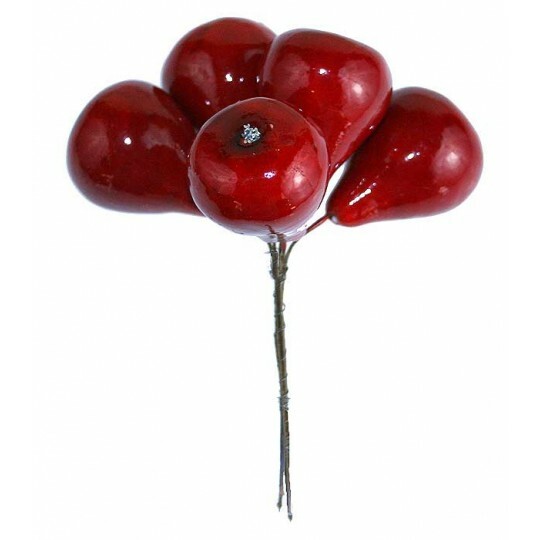 Each cherry measures 5/8" across and each leaf is 2" long. Bundle is 3-1/2" long overall. Made in Germany. 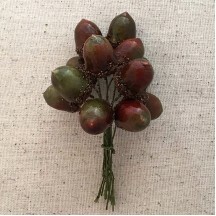 12 Vintage Old Stock Acorns ~ 7/8"
Bundle of 12 old store stock vintage acorns in green and brown ombre. Each measures 7/8" tall x 5/8" wide. Made in Germany. 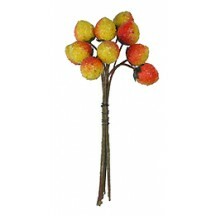 12 Vintage Old Stock Orange Apples ~ 1/2"
Bundle of 12 old store stock vintage orange lacquered apples. Each measures 1/2" wide x 1/2" tall. Made in Germany. 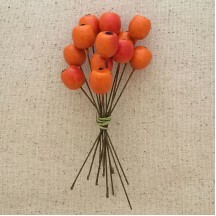 12 Vintage Old Stock Oranges ~ 1/2"
Bundle of 12 old store stock vintage matte lacquered oranges. Each measures 1/2" across. Made in Germany. 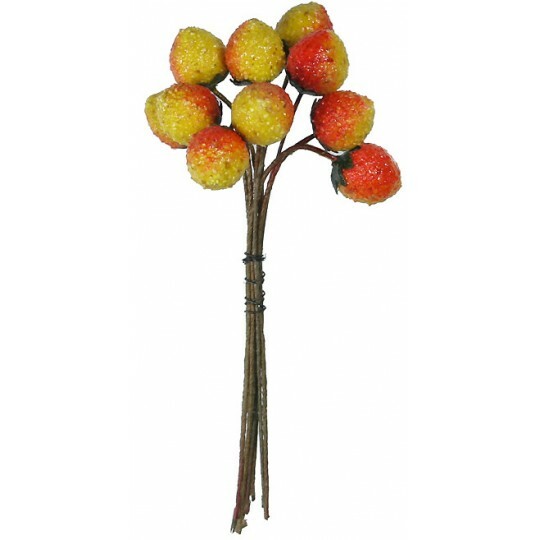 12 Vintage Old Stock Red Apples ~ 1/2"
Bundle of 12 old store stock vintage red lacquered apples. Each measures 5/8" wide x 1/2" tall. Made in Germany. 12 Vintage Yellow Lacquered Lemons ~ 3/4"
Bundle of 12 old store stock vintage lacquered yellow lemons with green blush. Each measures 3/4" tall x 5/8" wide. Made in Germany. 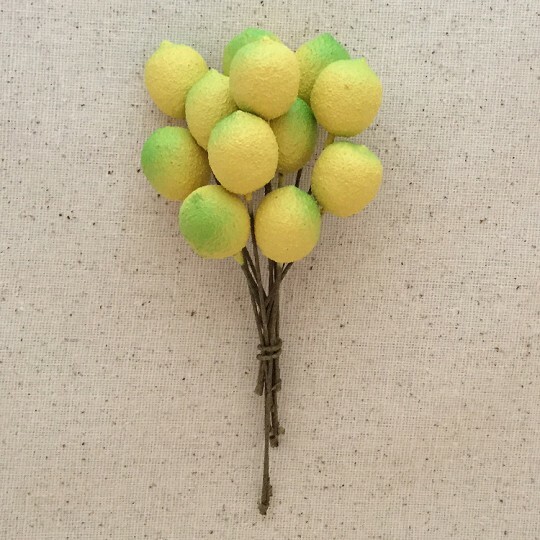 These are some of our favorite lemons ever. 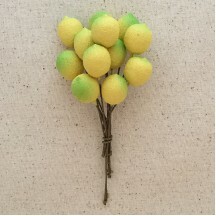 12 Vintage Yellow Textured Lemons ~ 5/8"
Bundle of 12 old store stock vintage textured yellow lemons with green blush. Each measures 5/8" tall x 5/8" wide. Made in Germany. 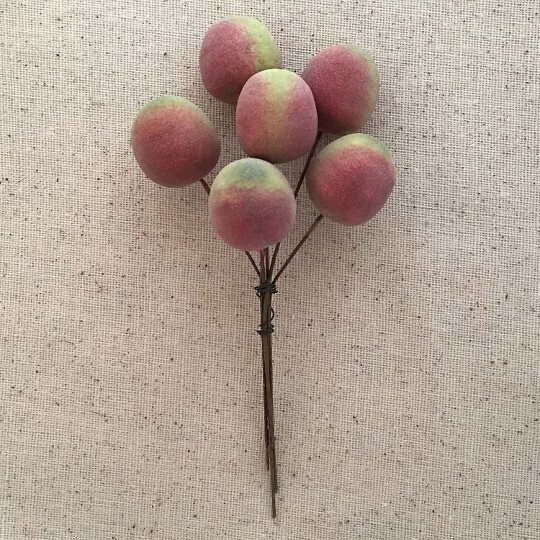 6 Vintage Old Stock Half Ripe Peaches ~ 1"
Bundle of 6 old store stock vintage matte half ripe peaches. Each measures 7/8" wide x 1" tall. Made in Germany. 12 Lacquered Spun Cotton Blueberries from Germany ~ 1/2"
Bundle of 12 spun cotton blueberries lacquered in a beautiful royal blue. Each measures 1/2" long x 1/2" wide on a 2" green paper covered wire stem. Made in Germany. 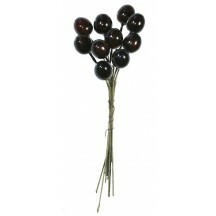 7 Brown Lacquered Spun Cotton Acorns ~ 7/8"
7 lacquered spun cotton acorns in glossy brown with textured light brown caps. 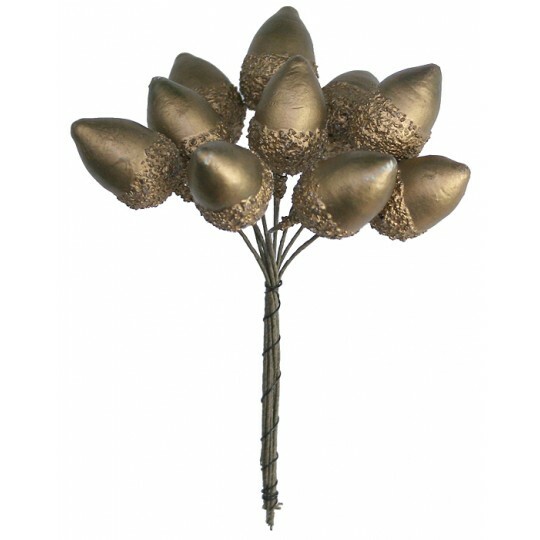 Each measures 7/8" long x 5/8" wide on a 2-1/2" green paper covered wire stem. Made in Germany. 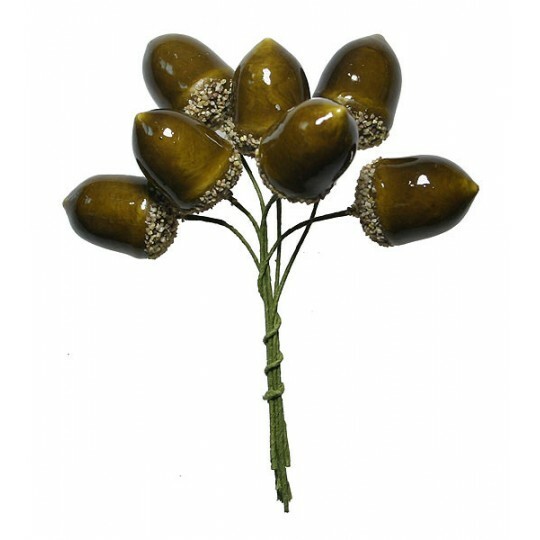 7 Golden Green Lacquered Spun Cotton Acorns ~ 7/8"
7 lacquered spun cotton acorns in glossy golden green with textured light brown caps. 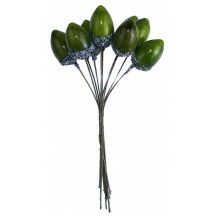 Each measures 7/8" long x 5/8" wide on a 2-1/2" green paper covered wire stem. Made in Germany. 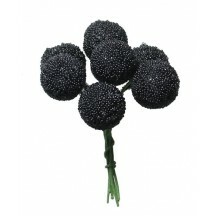 7 Textured Blackberries from Germany ~ 5/8"
Bundle of 7 blackberries embellished with micro beads for a textured look. 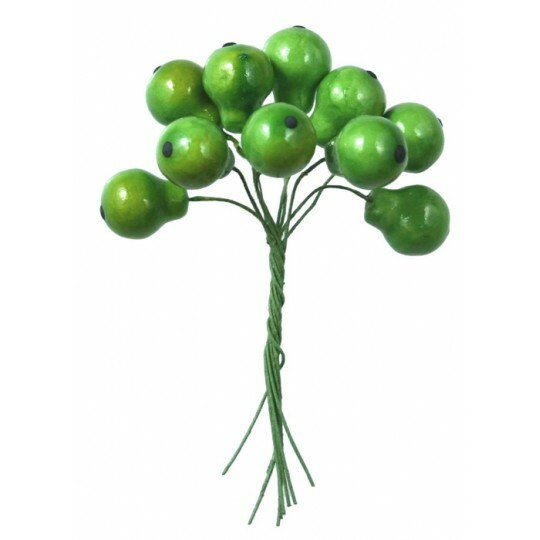 Each measures 5/8" long x 5/8" wide on a 2" green paper covered wire stem. Made in Germany. 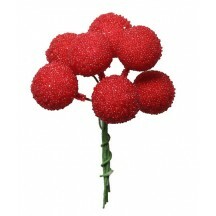 7 Textured Raspberries from Germany ~ 5/8"
Bundle of 7 red raspberries embellished with micro beads for a textured look. 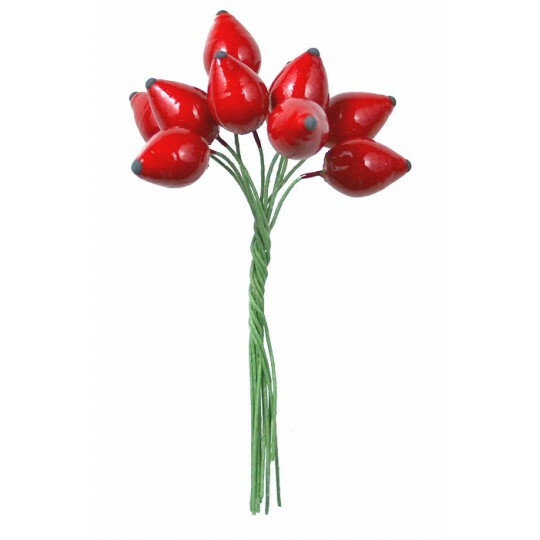 Each measures 5/8" long x 5/8" wide on a 2" green paper covered wire stem. Made in Germany. 5 Vintage Composition Half-Ripe Strawberries ~ 7/8"
5 old store stock vintage composition strawberries are each half matte red and half matte orange so they appear half ripened, with green paper leaves. 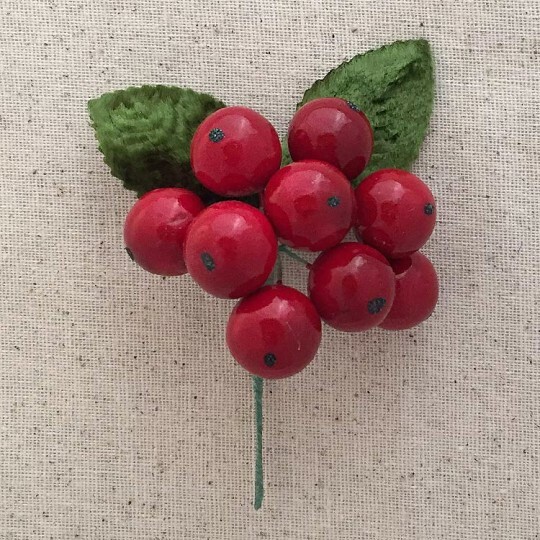 Berries have a subtle texture. 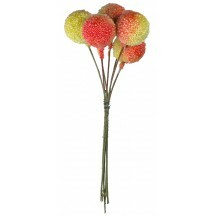 Each measures 7/8" long and 1/2" wide on a 3" green paper covered wire stem. Made in Germany, circa 1950-60. 10 lacquered spun cotton textured strawberries are deep red with green fabric leaves. Each measures 1/2" long and 1/2" wide on a 4" brown paper covered wire stem. 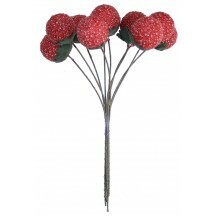 These were handmade in the Czech Republic. 10 lacquered spun cotton olives are glossy brown. Each measures 1/2" long and 3/8" wide on a 4" brown paper covered wire stem. These were handmade in the Czech Republic. 10 lacquered composition berries are glossy dark red. Each measures 1/2" long and 3/8" wide on a 4" brown paper covered wire stem. 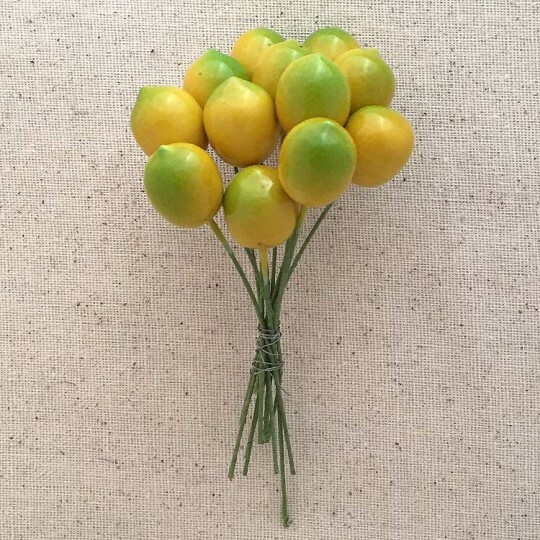 These were handmade in the Czech Republic. 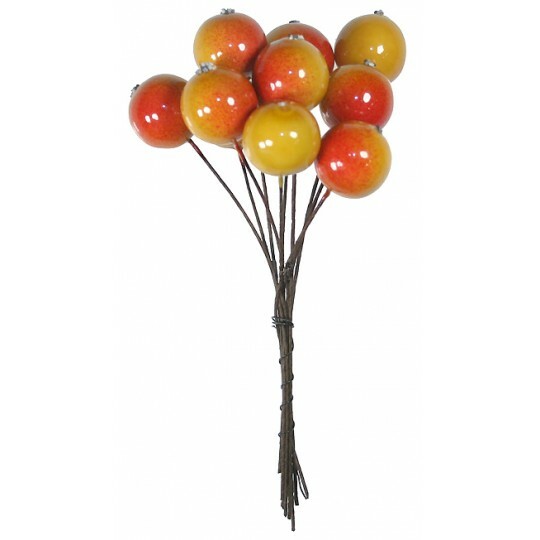 10 lacquered spun cotton apples are glossy yellow with orange blush. Each measures 1/2" long and 1/2" wide on a 4" brown paper covered wire stem. These were handmade in the Czech Republic. 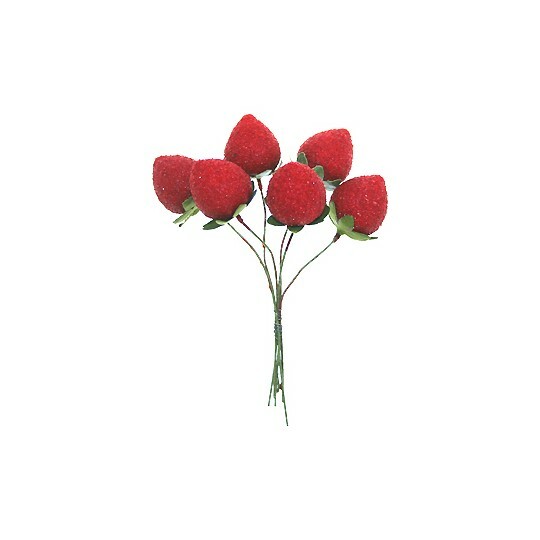 6 Large Red Vintage Composition Strawberries ~ 7/8"
6 old store stock vintage composition strawberries in matte red with green paper leaves. 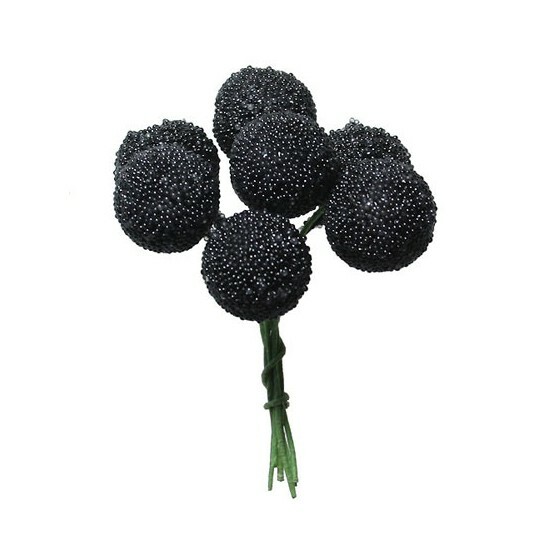 Berries have a subtle texture. 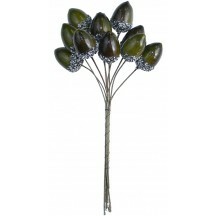 Each measures 7/8" long and 5/8" wide on a 3" green paper covered wire stem. Made in Germany, circa 1950-60. 10 lacquered spun cotton apples are glossy red. Each measures 5/8" long and 1/2" wide on a 4" brown paper covered wire stem. 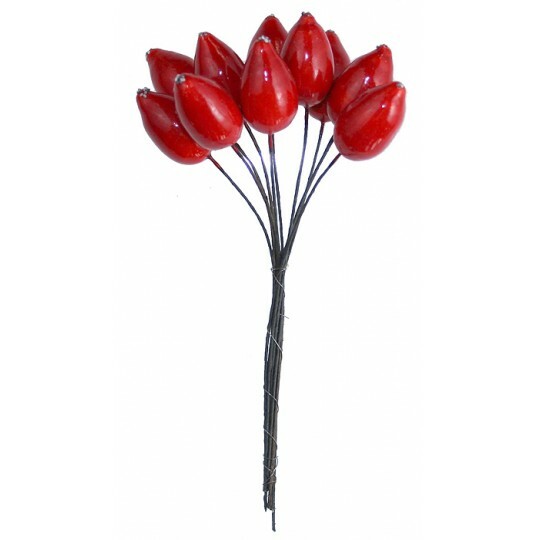 These were handmade in the Czech Republic. 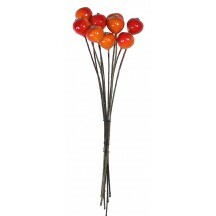 10 lacquered spun cotton apples are glossy orange with red highlights. Each measures 3/8" long and 3/8" wide on a 4" brown paper covered wire stem. These were handmade in the Czech Republic. 10 lacquered spun cotton apples are glossy yellow with orange blush. Each measures just under 5/8" long and 1/2" wide on a 4" brown paper covered wire stem. These were handmade in the Czech Republic. 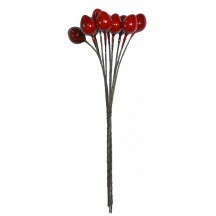 10 lacquered spun cotton rose hips are a rich, glossy red. Each measures 1" long and 1/2" wide on a 4" brown paper covered wire stem. 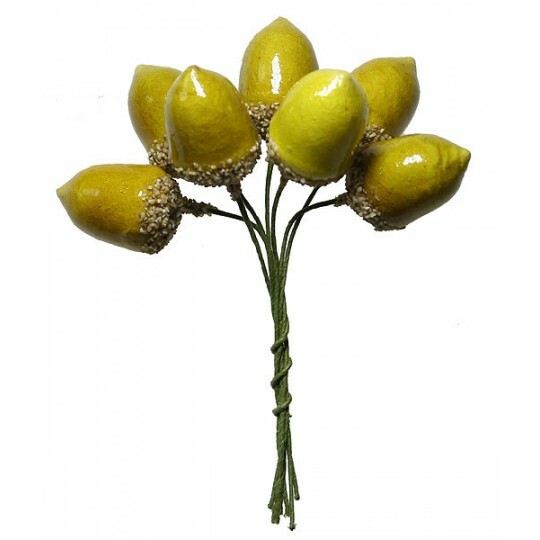 These were handmade in the Czech Republic. 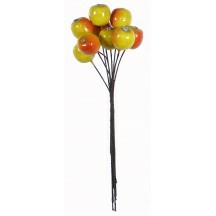 10 lacquered spun cotton apples are two tone golden yellow and red. 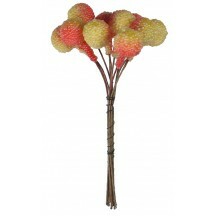 Each measures 5/8" long and 5/8" wide on a 3-1/2" brown paper covered wire stem. 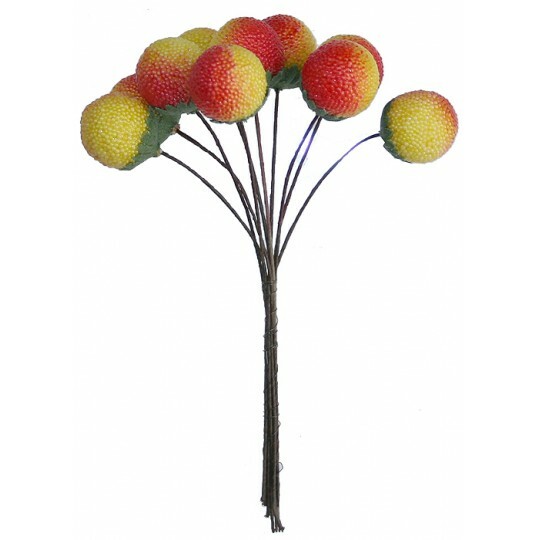 These were handmade in the Czech Republic. 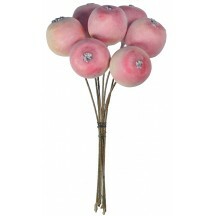 7 lacquered spun cotton apples are pastel two tone light yellow and pink with a sandy matte finish. 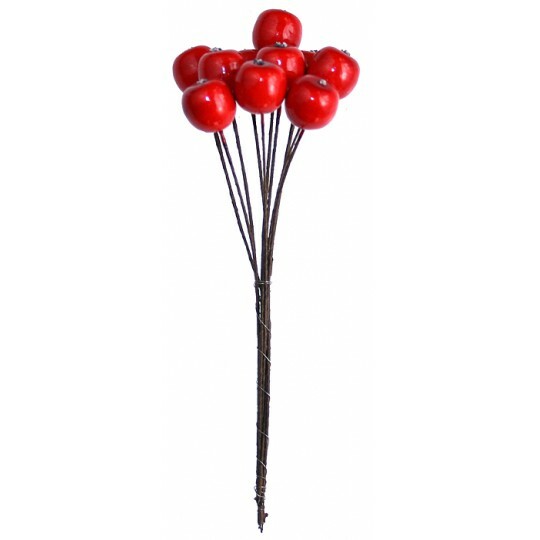 Each measures 3/4" long and just under 3/4" wide on a 3-1/2" brown paper covered wire stem. These were handmade in the Czech Republic. 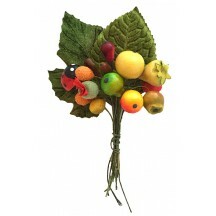 10 textured spun cotton strawberries are yellow and red -- half ripe -- with green fabric leaves. 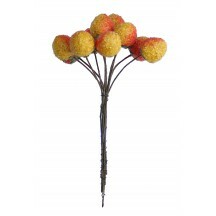 Each measures 5/8" long and 1/2" wide on a 3-1/2" brown paper covered wire stem. These were handmade in the Czech Republic. 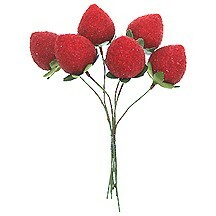 10 textured spun cotton strawberries are yellow and red -- half ripe -- with green fabric leaves. Each measures just over 3/8" long and 3/8" wide on a 3-1/2" brown paper covered wire stem. These were handmade in the Czech Republic. 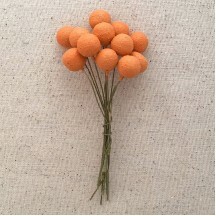 10 two tone textured spun cotton berries are yellow with orange accents. 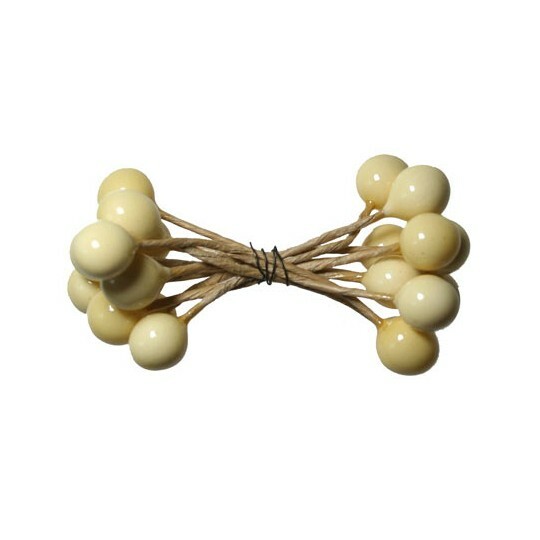 Each measures 1/2" long and 1/2" wide on a 3" brown paper covered wire stem. 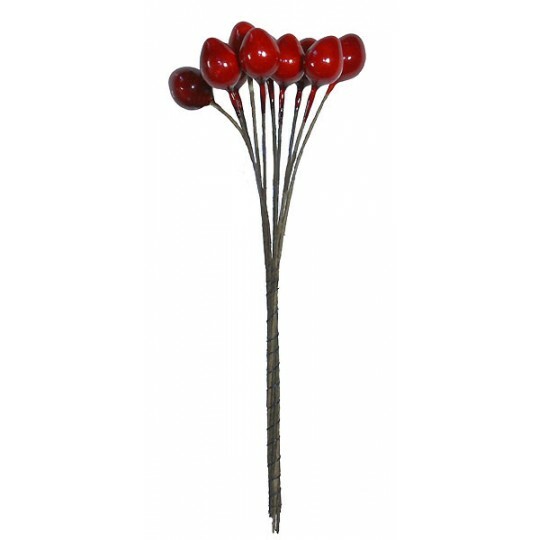 These were handmade in the Czech Republic. 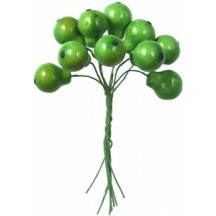 10 two tone textured spun cotton berries are green with red accents. Each measures just over 1/2" long and 1/2" wide on a 4" brown paper covered wire stem. 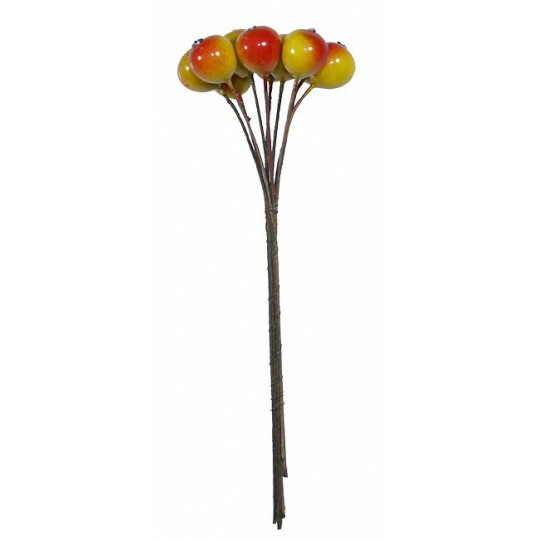 These were handmade in the Czech Republic. 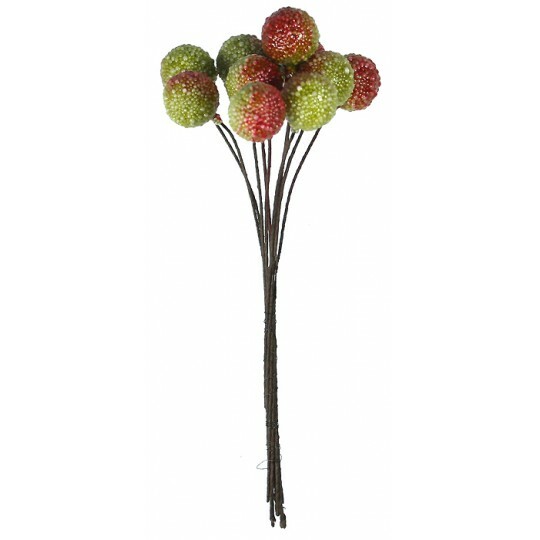 10 two tone textured spun cotton berries are green with red accents. Each measures 3/4" long and 3/4" wide on a 4" brown paper covered wire stem. 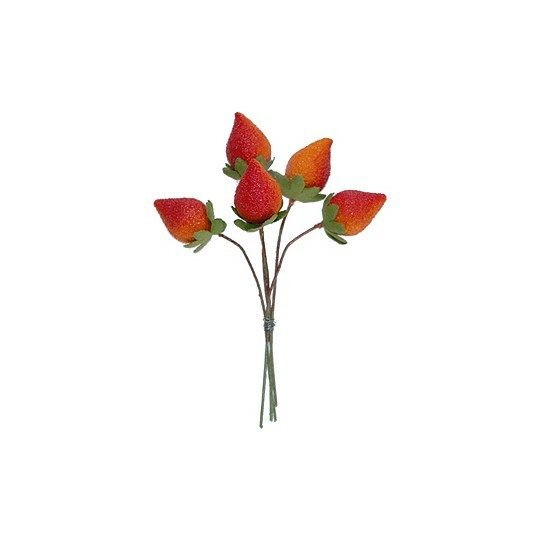 These were handmade in the Czech Republic. 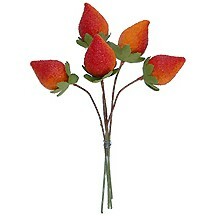 10 textured spun cotton strawberries are yellow and red -- half ripe -- with green fabric leaves. Each measures 7/8" long and 3/4" wide on a 4" brown paper covered wire stem. 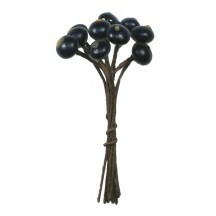 These were handmade in the Czech Republic. 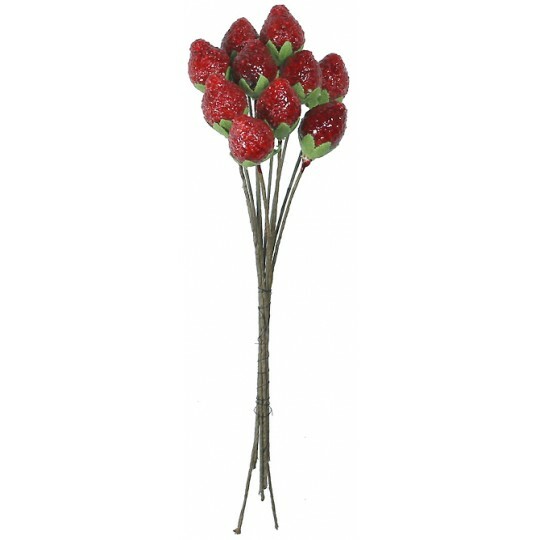 10 textured spun cotton strawberried are an antique red with green fabric leaves. Each measures 7/8" long and 3/4" wide on a 4" brown paper covered wire stem. These were handmade in the Czech Republic. 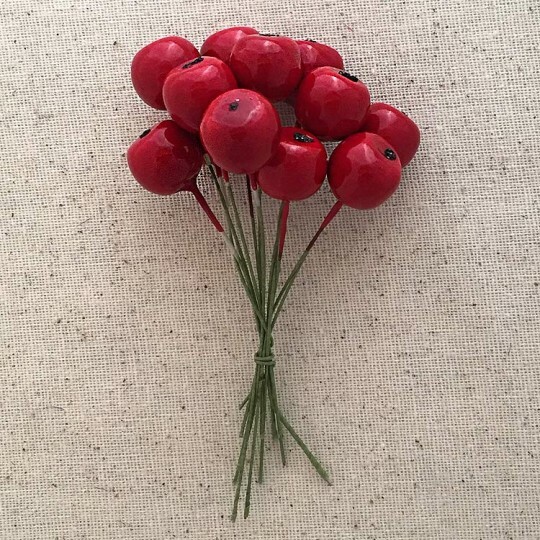 10 lacquered spun cotton apples are glossy red. 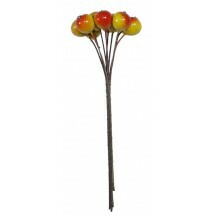 Each measures 3/4" long and 5/8" wide on a 3 1/2" green paper covered wire stem. Handmade in Germany. 10 lacquered spun cotton apples are glossy yellow with an orange blush. 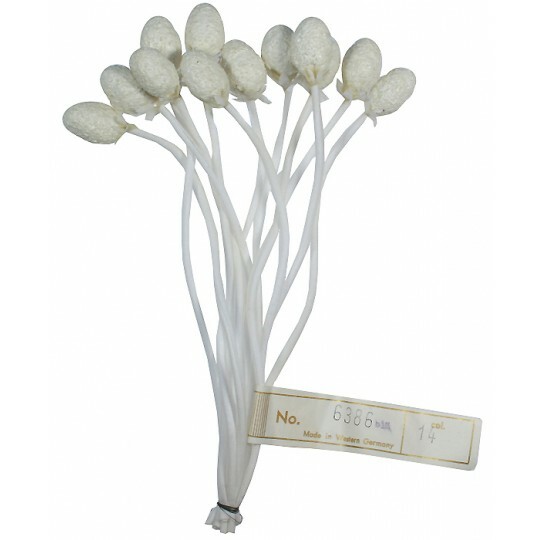 Each measures 3/4" long and 5/8" wide on a 3 1/2" green paper covered wire stem. Handmade in Germany. 10 lacquered spun cotton rose hips are glossy red. 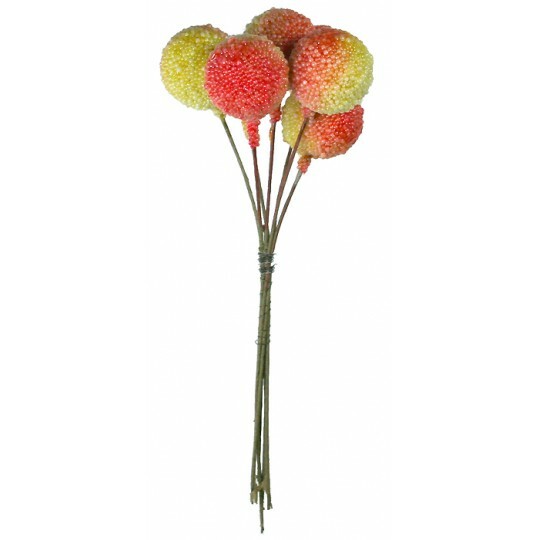 Each measures 5/8" long and 3/8" wide on a 3" green paper covered wire stem. Handmade in Germany. 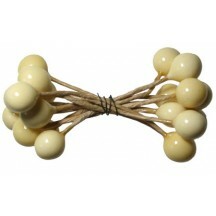 Glossy Ivory Berry Stamen from Germany ~ 1/2"
1 bundle of 10 double-ended berry stamen has 20 heads in glossy ivory. 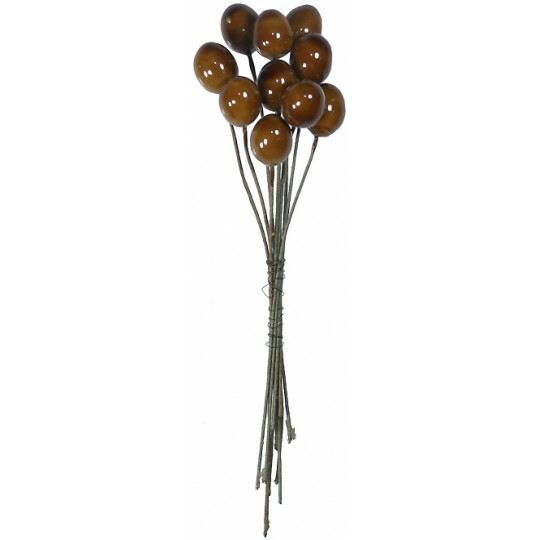 Stems are wire wrapped with tan paper, tips are lacquered composition. 2-1/2" long overall with tips measuring just over 1/2" long. Handmade in Germany. 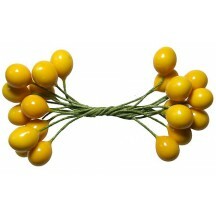 Glossy Yellow Berry Stamen from Germany ~ 3/8"
1 bundle of 12 double-ended berry stamen has 24 heads in glossy golden yellow. 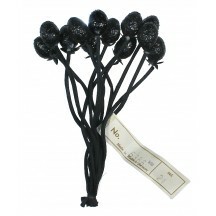 Stems are wire wrapped with dark green paper, tips are lacquered composition. 2-1/2" long overall with tips measuring just over 3/8" long. Handmade in Germany. 10 lacquered spun cotton acorns are a ripe green color. Each measures 7/8" long and 1/2" wide on a 4 1/2" brown paper covered wire. 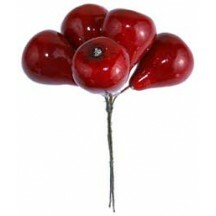 These were handmade in the Czech Republic. 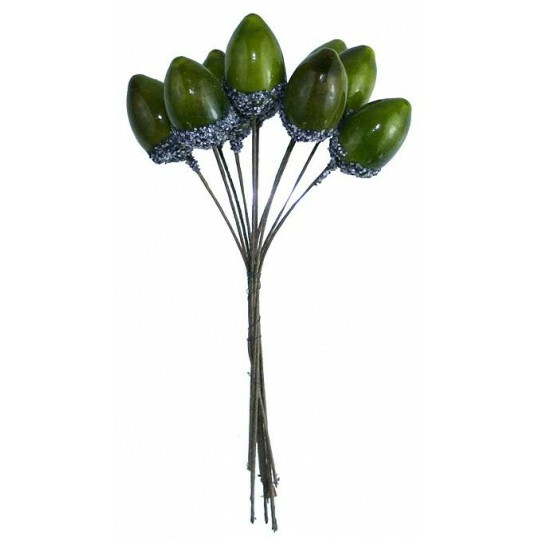 10 lacquered spun cotton acorns are green with subtle brown highlights on one side. Each measures 7/8" long and 1/2" wide on a 4 1/2" brown paper covered wire. 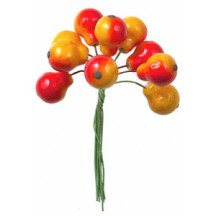 These were handmade in the Czech Republic. 10 lacquered spun cotton acorns are matte gold. Each measures 7/8" long and 1/2" wide on a 3 1/2" brown paper covered wire. These were handmade in the Czech Republic. 10 lacquered spun cotton acorns are matte silver. Each measures 7/8" long and 1/2" wide on a 3 1/2" brown paper covered wire. 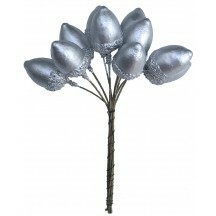 These were handmade in the Czech Republic. 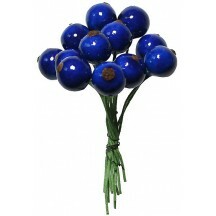 10 Deep Navy Blueberries ~ 1/4"
Bundle of 10 blueberries in deep navy blue . Each berry measures approximately 1/4" tall by 3/8" wide on a 3" brown paper wrapped wire stem. Imported and newly made. 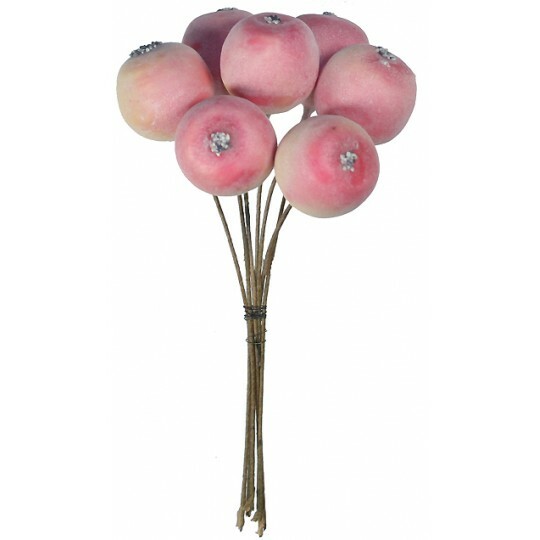 5 lacquered spun cotton pears are a rich deep red. 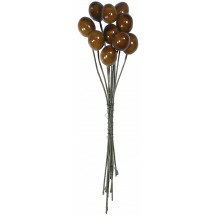 Each measures 1 3/4" long and 1 1/4" wide on a 3" brown paper covered wire stem. 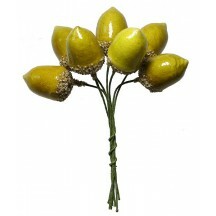 These were handmade in the Czech Republic.